In a huge boost for the Ballarat Turf Club, funding has been made available for two major enhancements to the Ballarat racecourse at Dowling Forest. Premier of Victoria and Minister for Racing Denis Napthine said funding would be provided for a new big screen for racegoers, along with a bigger and better owners lounge. “Racegoers will get a better view of the action all year round now with the installation of a 36 square metre big screen on the inside of the course,” Dr Napthine said. “This screen will be ready when the Ballarat Cup is run for the first time as a stand-alone Saturday race meeting in November,” Dr Napthine said. Dr Napthine said the vastly enhanced and expanded owners lounge will make a major difference to the race day experience for those who make an investment – small or large – in Victorian racing through buying and owning a racehorse. “Racehorse syndication and the trend for horses to have multiple owners has become increasingly popular, so it’s important to improve these facilities to ensure the club adequately caters for large owner groups,” Dr Napthine said. Ballarat Turf Club CEO Lachlan McKenzie said the club was delighted to receive funding for the upgraded owners facility and new big screen. “The screen will drastically improve the race day experience for all patrons, providing them with high quality vision of racing from other venues as well as the broadcast of messages relating to the day,” Mr McKenzie said. “The upgraded owners facility will enable us to enhance the race day experience for horse owners, who are extremely important to us,” Mr McKenzie said. Country Racing Victoria (CRV) Chief Executive Scott Whiteman said that Racing Victoria and CRV are delighted with the support the Napthine Government has given the Ballarat Turf Club. 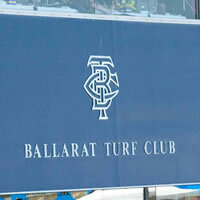 “The Ballarat Turf Club plays a key role in the Victorian thoroughbred racing industry and the local community. The owners lounge project is extremely important as it will significantly enhance the race day experience for owners who are the lifeblood of the industry,” Mr Whiteman said. Dr Napthine said the Victorian Coalition Government is a strong supporter of country racing and is committed to further developing the economic and social benefits arising from the racing industry. “The racing industry provides an economic benefit of $96.4 million to the Central Highlands region, including 956 full-time jobs and the direct participation of more than 5,000 people,” Dr Napthine said. Dr Napthine said the Coalition Government is providing $146,050 from the Victorian Racing Industry Fund for the two projects with the Ballarat Turf Club providing $126,049 and Racing Victoria and Country Racing Victoria jointly contributing $20,000. How much is owning a Melbourne Cup runner worth?